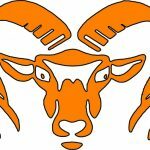 A football season teetering on the edge for Rockford three weeks ago after the team fell to 1-3 following a disheartening 33-14 loss to Muskegon Mona Shores has now definitively gone in the opposite direction. 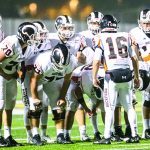 The streak of wins has now grown to three after Rockford dominated a 5-1 Hudsonville team defensively and on special teams on their way to a key 13-7 victory on the road on Friday, October 5th. With the win Rockford now sits at 4-3 overall and still very much in the picture in OK Red play with a 3-1 mark. That leaves two weeks in regular season play with a huge game against Grandville for Homecoming this week before concluding the year with a trip to East Kentwood to square off with the only undefeated team left in the conference, Win both and the Rams have at least a share of the league crown and a guaranteed spot in the Michigan High School Athletic Association playoffs for the 24th straight year. Split the games and the best they could attain is a wild card berth while sneaking into the post season. Defense was the calling card for the Rams in the Hudsonville win. The Eagles would not even have dented the scoreboard save for a prayer tossed up following a botched hold on a field goal attempt. 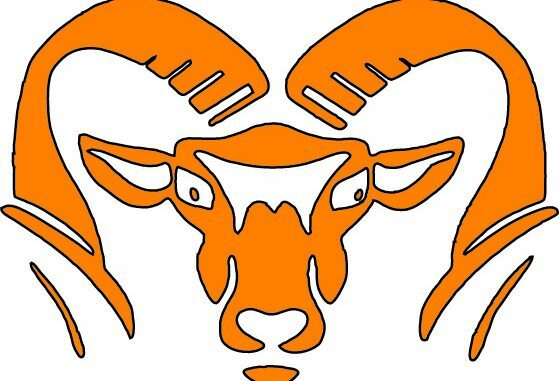 Rockford held the potent Hudsonville offense to a total of 165 yards. Included in that total was a rushing attack for Hudsonville that netted only 51 yards on 33 carries. 43 of those yards came on a single carry. That meant that the other 32 attempts gained exactly eight yards for the Eagles after factoring in multiple sacks and tackles for loss. The catalyst for Rockford was senior defensive lineman Cade Klimczak. Defensive linemen usually have a tough time dominating the stat page but Klimczak went far beyond being a blip on the radar with a sterling overall effort. Klimczak accounted for 8 tackles with 2 sacks accounting for 17 yards and another tackle for loss for good measure. He was nigh unto unblockable all night long. Another key factor for Rockford was the right foot of sophomore kicker Teagen Lenderink. Lenderink nailed a 38-yard field goal with :57 seconds remaining in the first quarter to account for the first points of the game and give Rockford a 3-0 lead. After Hudsonville’s lone score of the game gave them a 7-3 lead at the half, Lenderink duplicated that effort with another 38-yarder to make it 7-6 after Rockford’s first drive of the second half. The decisive score of the night for Rockford came on a third down and eight play from the Eagle 28-yard line late in the third quarter. On the snap sophomore quarterback Chris Corey fired a long pass downfield that hit junior wide receiver Eli Haddad in stride inside the five yard line. Haddad sped into the end zone with 2:40 to play in the third stanza to give the Rams a lead they refused to relinquish. Lenderink’s point after made it 13-7 and that was how the game eventually ended. Hudsonville had a pair of drives later that advanced to the Rockford 13 and 21-yard lines but they were turned away both times. The Rams took over after the last defensive stand needing a first down or two to run out the clock. That was exactly what transpired as first Jaiden Friesen and then Connor White rambled for first downs before Rockford took a knee to cement the win. Jack Richardson and Friesen both amassed 54 yards rushing to pace the ground attack for Rockford. Corey was 5 for 11 passing for 87 yards and a touchdown. Nate Bareno had two receptions for 40 yards and Haddad added two cateches for 34 yards. 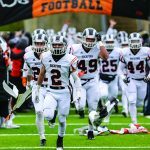 Ian Rodriguez actually led Rockford in tackles with nine including 1.5 tackles for loss, a sack and a fumble recovery. Dylan Dams had eight stops including a pair of sacks and Jarrett Plekes chipped in with 7 tackles that also included 1.5 tackles for loss. The homecoming affair with Grandville is slated for a 7:00 P.M. kickoff at Ted Carlson Memorial Stadium on Friday, October 12th.